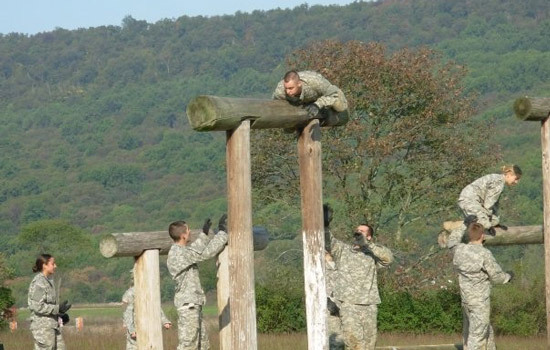 RIT Army ROTC cadets on the fitness course at the Leader Development Assessment Course. Of the 272 colleges with Army Reserve Officer Training Corps programs, Rochester Institute of Technology’s Tiger Battalion was more than an “Army of One.” The RIT Battalion was awarded the Eastern Region’s Outstanding ROTC Unit Award, given annually by the Order of the Founders and Patriots of America. The prestigious award is given to the Army ROTC unit for overall military training, academic achievement, retaining and graduating 90 percent or better of the cadets enrolled in its campus program, achieving high ratings in command inspections, and leading all battalions at the premier ROTC event, the Leader Development Assessment Course held at Fort Lewis, Wash.
Seventy-one percent of the RIT cadets attending the grueling, 32-day course last summer achieved an overall “excellent” rating in their evaluated leadership roles, an achievement which topped all other battalions in the Eastern Region. “LDAC is like a five-week final exam for the cadets,” says Maj. Donald Powell, training officer for the RIT battalion. “There’s no secret to it, this is a lot of hard work on their part.” Cadets are measured on fitness, land navigation, and exercises for garrison and tactical situations. This is the first time the RIT Army ROTC group has won the Outstanding ROTC Unit award.